D.E. Stevenson was a best-selling author in the first half of the twentieth century, with over seven million books sold during a long and productive career. She is little known today but these three republished books should go some way to remedying that situation. Dorothy Emily Stevenson was born in Edinburgh, in 1892. Her father, David Alan Stevenson, was one of the famous Lighthouse Stevensons, and she was cousin to one of Scotland’s most celebrated writers, Robert Louis Stevenson. When she married Major James Reid Peploe in 1916, she also became related to the brilliant Scottish Colourist Samuel Peploe. In these new reissues, Alexander McCall Smith provides a charming introduction to Stevenson’s work which he rates highly for their simplicity and her ability to tell amiable tales well. All three books are written in the style of a diary which gives the reader a sense of intimacy, reading the private thoughts of Mrs Tim as she documents her life with her family, friends, and comments on major world events. 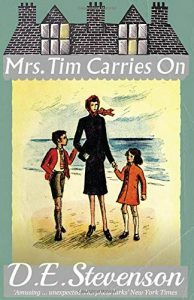 Mrs Tim Carries On opens in February 1940, the early months of World War II, when Hester Christie waves her husband, Major Tim, off at the railway station. He has been stationed to France and when she gets home Mrs Tim is distracted from having a good cry by the presence of her friend, Grace. Hester’s stiff upper lip is very much in evidence. 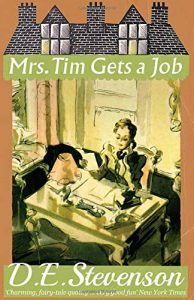 Mrs Tim has two children, a faithful maid in Annie, and a comfortable upper middle-class lifestyle. If Mrs Tim had been portrayed in a film, Celia Johnston (Brief Encounter) would have been perfect for the role. There are also shades of Greer Garson in the wartime saga Mrs Miniver, as Mrs Tim navigates the changes brought by the war with true British pluck. Although highly amusing, Mrs Tim’s diary entries also document the privations of the home front during World War II and the reactions to their first air raid. Major Tim’s perilous escape from occupied France brings the dangers of the war very close to home. As a stalwart military wife, Mrs Tim helps out at the regiment’s comfort depot, and is always on hand to provide advice or a shoulder to cry on for other military wives. The humour may be gentle but Mrs Tim is occasionally waspish in her assessment of the people she meets, which adds a little spice to her tales. Mrs Tim Gets a Job illustrates the continuing privations of post-war Britain, as Hester scrabbles around to find enough clothing vouchers to buy her daughter a uniform for her new boarding school. 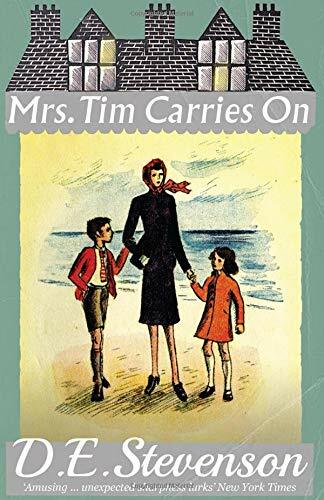 With her son already at boarding school and Major Tim stationed in Egypt, Mrs Tim is at a loose end but solves this problem by taking a job in a country hotel run by the redoubtable Erica Clutterbuck and is soon engulfed in the lives of hotel guests as well as her own friends and family. In Mrs Tim Flies Home, published in 1952, Stevenson ends the gentle adventures of Hester. 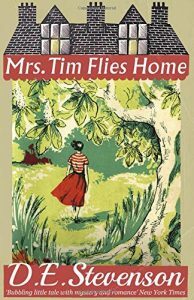 After an idyllic eighteen months living with Major Tim in Kenya, Mrs Tim returns to Britain to her almost adult children and starts to pick up the threads of her life once more, in a country that is slowly recovering from the war. Initially, she thinks that life in Old Quinings will be somewhat sedate but soon finds herself embroiled in local matters. It is a sweet tale with which to close the amusing diaries of Hester Christie, known to all as the amazing Mrs Tim. The three Mrs Tim novels offer a fascinating glimpse into a now-vanished world and also remind us that women are so often written out of history. Although Mrs Tim lives a very secure and privileged life, Stevenson’s delightful tales show how war impacts every level of society. These novels will appeal to anyone who has a military spouse, those interested in the history of the Home Front during World War II, or anyone who enjoys an easy but very entertaining read.